Welcome to the Teacher Professional Blogging Sandbox site. I’ve created this site to support students and instructors in the Teacher Education Program at UBC as they develop their professional blogs. Each page houses information, links and resources to help you build your own professional blog or resource website. As part of your journey in Teacher Education here at UBC, it is strongly recommended that you begin a professional blog as a way of sharing your year-long inquiry and reflections on teaching and learning. If you do so using UBC Blogs WordPress, you are using a safe, secure and Canadian housed server environment in keeping with FOIPPA. *If you choose to create a blog using an alternative server or platform, you may do so but need to be aware of how FOIPPA impacts the choices you make as you post. To ‘get started’, visit UBC Blogs and login with your CWL. This video tutorial can walk you through the steps and inform you of some of the important considerations. As you build your blog, you may wish to keep the blog ‘hidden’ or ‘private’ – until you are ready to begin sharing with a wider audience (your instructors, the UBC Blogs community or even the World!). By default, your blog in UBC Blogs is public, but you can make it private: Please see this post for information about adjusting the privacy settings of your blog. Click on ‘Video Tutorials’ in the menu, to view a series of ‘how-to’ blog posts. The posts are searchable by key word (categories and tags). I will use this site as a blogging ‘sandbox’ where I will mess around with features within UBC Blogs/Wordpress and attempt to explain how I did what I did in the Tutorials category. As I develop it, I’ll try to keep the look and feel of a professional blog or resource website to give you ideas about design and navigation. I have created this site with a “static home page” (this Welcome page). That means, when someone ‘lands’ on this site, they get a page with whatever content I’ve added to it (text, image, etc) – i.e. a Welcome Page. I’ve selected the ‘FAQ’ page as the landing spot for my posts. My latest posts will appear on that page. NB: A Welcome Page on a professional web-space might orient visitors to your site… it could be graphic, screen-cast, text or a combination. 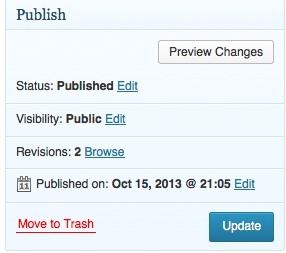 *Go to your Dashboard, Select ‘Appearance’, ‘Customize’ and select either a static page or posts driven landing page. See an example of a ‘post driven’ blog here. I would use this format if I planned to regularly add new posts to my site. Please feel free to email if there is information you need but can’t find and I’ll try to add it. You can also find links and resources on the Scarfe Digital Sandbox Blog. To Set up your own Blog: login to UBCBlogs with your CWL and follow the onscreen instructions to set up a new blog. *The site title can be changed anytime, the site name will become your URL so choose carefully. The final setup step is to set permissions or privacy settings. You might want to start by having your site only visible to you as the administrator until you are ready to ‘launch’. You will be able to change your permissions at anytime. To change the overall privacy settings in your blog, from your ‘Dashboard’, navigate to ‘Settings’ and select ‘Reading’ and make the adjustments that suit your needs. You can view this video tutorial. NB: each page has it’s own ‘visibility’ permissions – by default they are public (public just means to whatever level you have supplied permissions… only ‘fully’ public if you have adjusted your permissions to be a public blog on the net). You can set them as private or password protected, watch this video for more details. Questions? Comments? Clarification? Something you’re trying to figure out? Feel free to email or post a comment on one of the pages in this blog. Yvonne, a great resource for the teacher candidates. We are starting on some of this now in InquiryI!